The key elements of the T.I. approach– balance, streamlining, and propulsion– are based upon the physics of how bodies move through water, a combination of the principles of hydrodynamics and the principles of biomechanics. It’s interesting, then, to see how these key elements of movement science that we emphasize in swimming efficiently can be observed in parallel examples in other areas of life, be it in other sports or in nature. 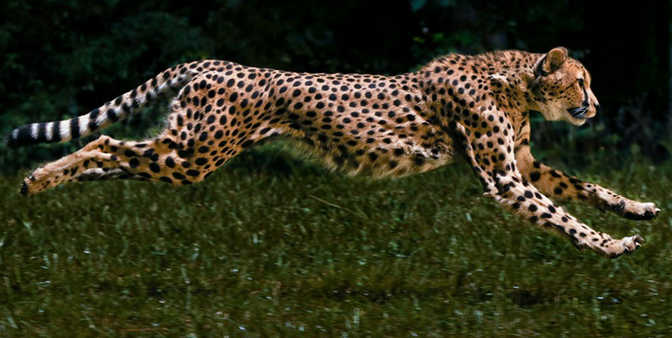 Inspired by the incredible slow-motion footage of cheetahs captured by photographer Greg Wilson in his award-winning video (video embedded below), this December 2012 blog from Terry Laughlin is an insightful analysis of what humans can learn from the world’s fastest runners about cultivating efficient speed– and how there are analogous connections between the natural speed of cheetahs and the consciously-cultivated speed of T.I. swimming. Enjoy this rare footage… and Happy Laps! I’ve long believed that there are universal laws underpinning the highest skilled movement. Among the simplest is “What Is Most Beautiful Is Also Best.” This extraordinary National Geographic Channel video of the fastest creature on four legs reaffirms my faith in that. These slow motion studies offer an unprecedented opportunity to understand why cheetahs can reach speeds of up to 60mph/97kph. And will probably not surprise regular readers of this blog that I discerned in the cheetah’s running mechanics several matches for key points in T.I. Technique principles (outlined below) — as well as a lesson we could all do well to emulate. The cheetah’s head is amazingly stable. The cheetah achieves full extension of its bodyline in every stride. The cheetah uses a compact, relaxed “recovery” (bringing fore paws forward close to the body). The cheetah runs with its whole body, not its limbs. The cheetah places its fore paw with striking care — even delicacy. The equivalent in T.I. Swimming is relaxed hands, patient catch, and “gathering moonbeams” (taking care in initiating pressure). The cheetah sacrifices none of these qualities at its highest speeds and stride rates. In fact it seems to do them most exquisitely when it is moving at maximum speed. It reaches its Maximum Stride Length when it’s also at Maximum Speed — which is, of course, the secret to being the fastest runner on the planet. As we know, human swimmers do exactly the opposite when striving to swim fast. We sacrifice Stroke Length as we increase Stroke Rate– sometimes quite radically. Alain Bernard, while anchoring France’s 4×100 relay in Beijing, being a high profile example; Usain Bolt, in contrast, ran as the cheetah does, achieving his Max Stride Length at max speed. Cheetahs run fast by nature. We must swim fast mindfully. Using a Phantom camera filming at 1200 frames per second while zooming beside a sprinting cheetah, the team captured every nuance of the cat’s movement as it reached top speeds of 60+ miles per hour. The extraordinary footage that follows is a compilation of multiple runs by five cheetahs during three days of filming.